Is the future of scientific publishing in-house open access? 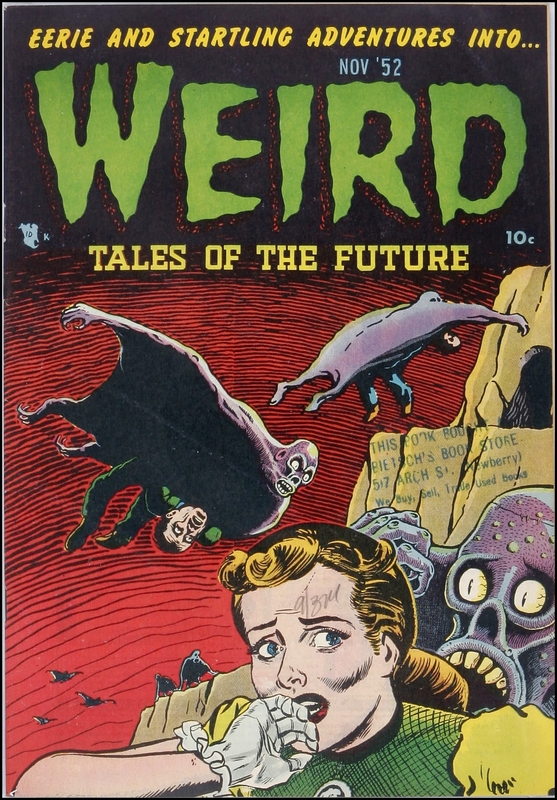 Photo from flickr user Tom Marxchivist, 1952 cover by Basil Wolverton, used under CC attribution license. Those of you that frequent theScinder know that I am pretty passionate about how science is disseminated, and you have probably noticed that, like their brethren in newsprint and magazine before them, the big-name publishers don’t know exactly how to react to a changing future, and despite what traditional publishers would have you believe, they are not immune to publishing tripe. Nature may be butting heads with Duke University over requesting waivers for the open access policy in place there. Apparently the waiver request isn’t even necessarily based on the practical implementation of Duke’s open access policy (Nature allows articles to be made freely available in their final version 6 months after publication), but it does raise the question: how much hassle will universities and their faculty put up with before they take matters into their own hands? As MIT’s Samuel Gershman points out, modern publishing doesn’t cost all that much. Even the fairly exorbitant fees charged to authors by the “gold standard” of open access publishers may be a transient relic of the conventional (turning archaic?) publishing business model. This provides incentive for predatory publishing (as discussed in this article at The Scientist and the basis for the Bohannon article published in Science last October) But if peer review and editing is largely volunteer labour, performed as an essential component of the role of a researcher and with the bill largely footed as a public expenditure, why keep paying enormous subscription fees for traditional publishing? If the trend catches on, as it almost certainly will, leading institutions will continue to adopt open access policies and libraries will see less and less reason to keep paying for outdated subscriptions. Scholarly Publishing: Where is Plan B? Author theScinderPosted on March 30, 2014 March 30, 2014 Categories UncategorizedTags career, John Bohannon, publication, publishing, science, scientific literacy, tropesLeave a comment on Is the future of scientific publishing in-house open access? In order to quantitatively examine the effect of the the 3D printed Lieberkühn reflectors I described previously, I came up with two image quality metrics relevant to their use, both measured on the “dark side” of the image subject. 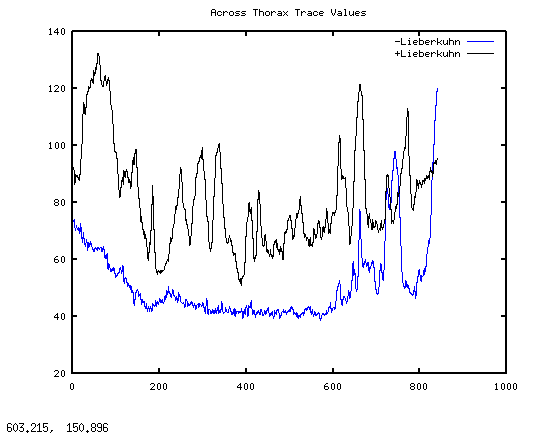 The metrics we will look at today are average intensity and, as a measure of contrast, the standard deviation of pixel values on a line trace. I’ll be using the Megachile photo from the previous post for these analyses. 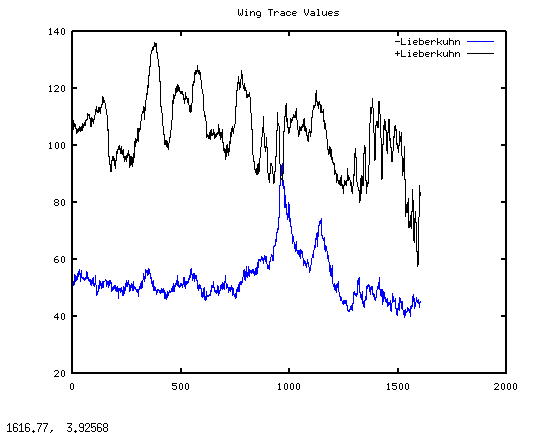 If we plot these values together, we see that the photo taken with the Lieberkühn (values in black) is brighter and brings out a lot more detail, while the photo taken without is relatively flat and dark. 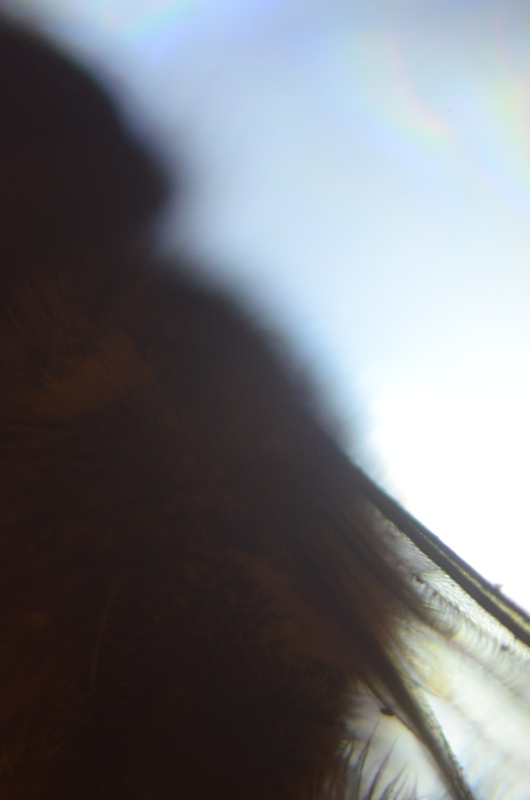 We see similar results for second and third traces, taken across the tegula and along the wing. 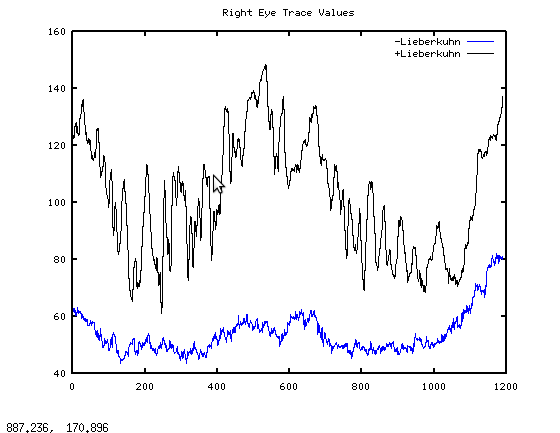 We see that taken together, the averages of the plots from the photo taken with the Lieberkühn are about 80% brighter than those without. Using standard deviation as a metric for image detail, we get an increase of about 75% in standard deviation over the dark photo by using the reflector. The averages, standard deviation etc. may seem a bit redundant at this point; you don’t need to plot a pixel-value profile to see that the image with the reflector is much brighter and more detailed than the photo taken without. Rather than “proving” that the Lieberkühn photos are better, these notes will serve as a baseline for future iterations of the reflectors made with different materials and/or with the addition of a reflective coating. 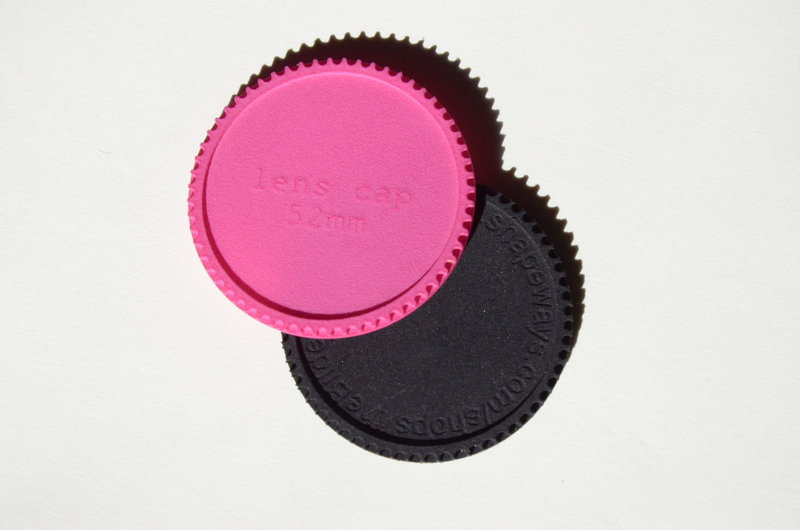 Most lenses already have a standard, secure method for attaching accessories to the distal end. So why do we still put up with the infamy of squeeze-style caps that are so easily lost? 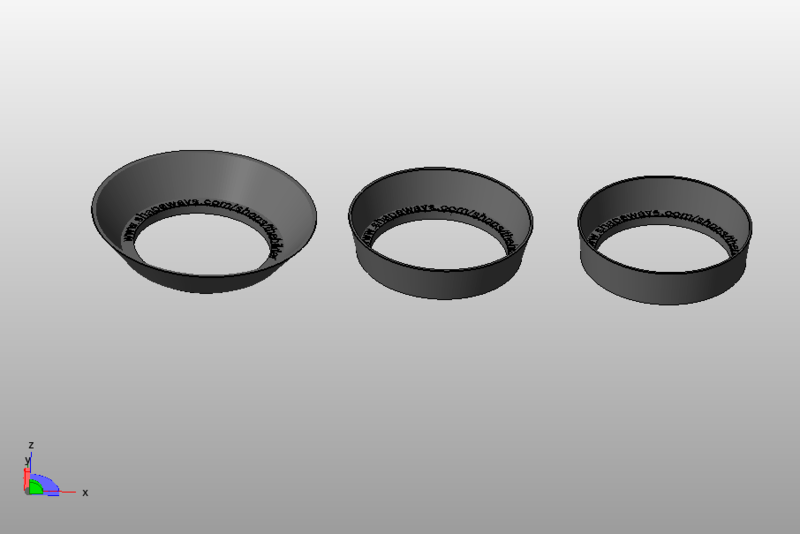 Below are some iterations of my designs for threaded lens caps, designed with information on the lens filter thread standards from Wikipedia, and printed in various colors of Shapeways basic sintered plastic. They’re durable, can be colorful, and it’s possible to emboss custom text or an image on the front. Oh, and I never worry about them falling off in the bag. Standard sizes can be bought from http://www.shapeways.com/shops/thebilder and there is a custom option for personalized text. 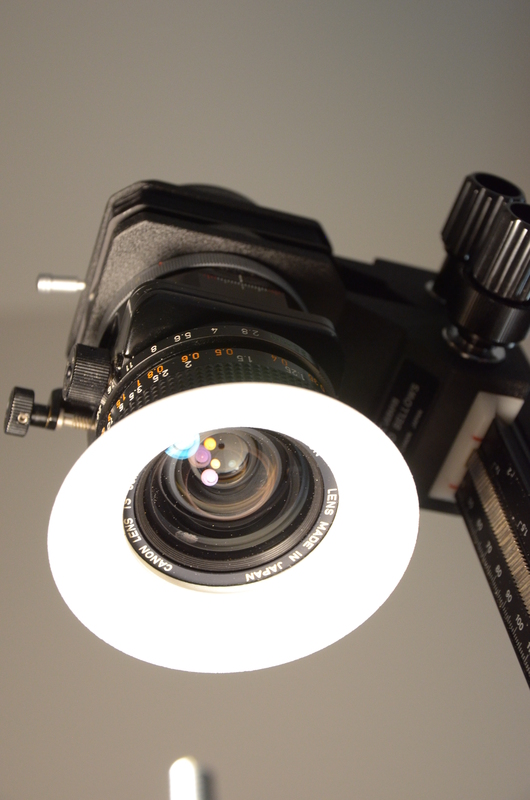 I am planning to make some more test shots with Lieberkühn reflectors soon, so stay tuned! 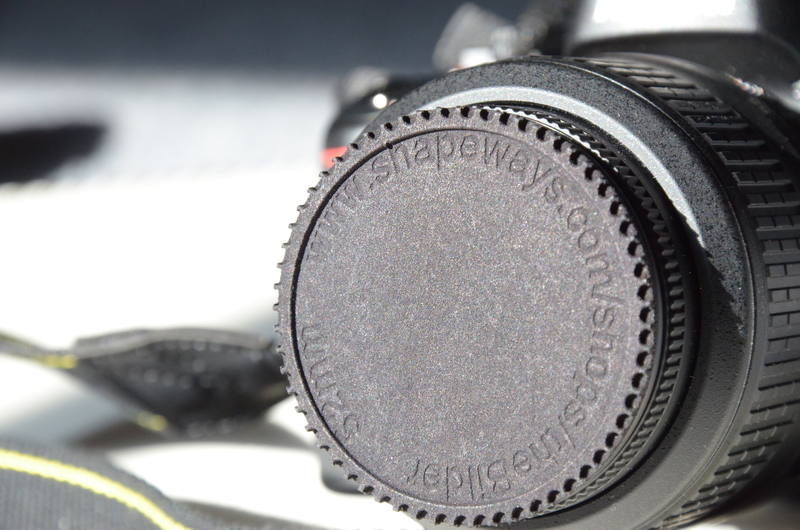 Here I will report my initial tests of my Lieberkühn reflector designs, “hot” off the 3D printers at Shapeways. 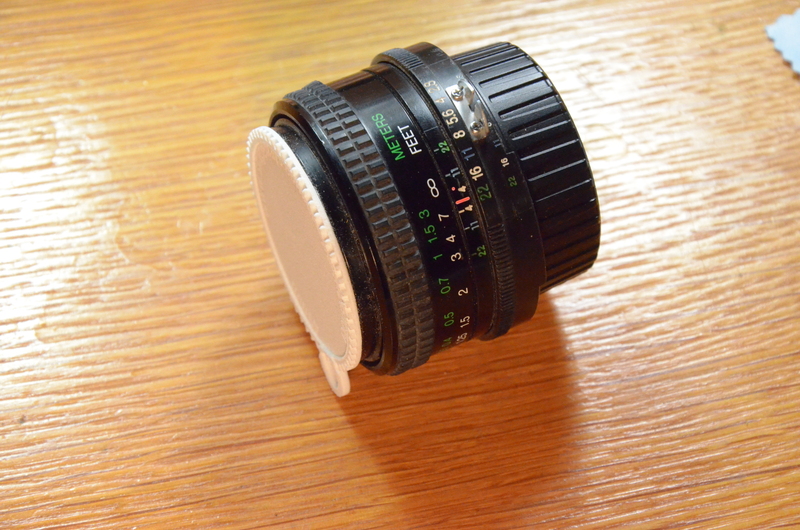 I am testing a squeeze-to-attach Lieberkühn that roughly fits a Canon f/3.5 20mm focal length macro lens (above), and a 58mm threaded version (below), tested with a Canon 35mm f/2.8 manual tilt shift lens. I used a Canon auto macro bellows and a Nikon D5100 with an adapter for all test images. I haven’t added any reflective material to them yet, so they are essentially “Lieberkühn diffusers” for these tests. 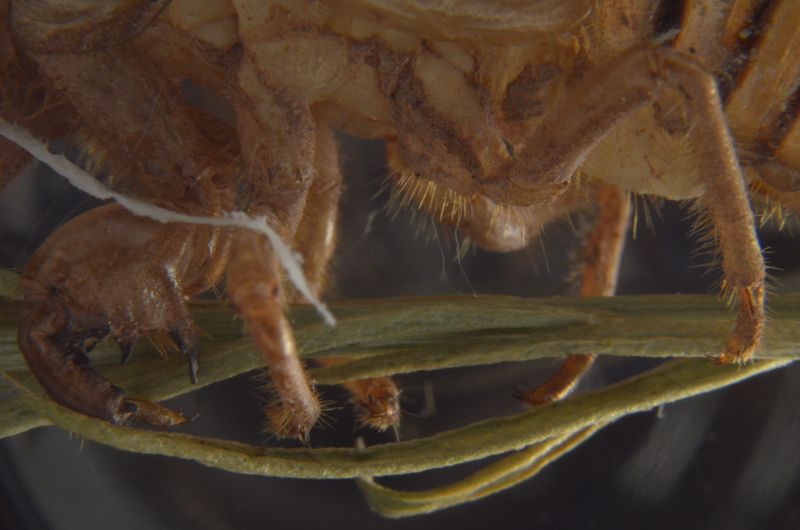 I used a domestic desk lamp with a 750 lumen halogen bulb to illuminate the specimens, for slightly off-axis trans illumination. 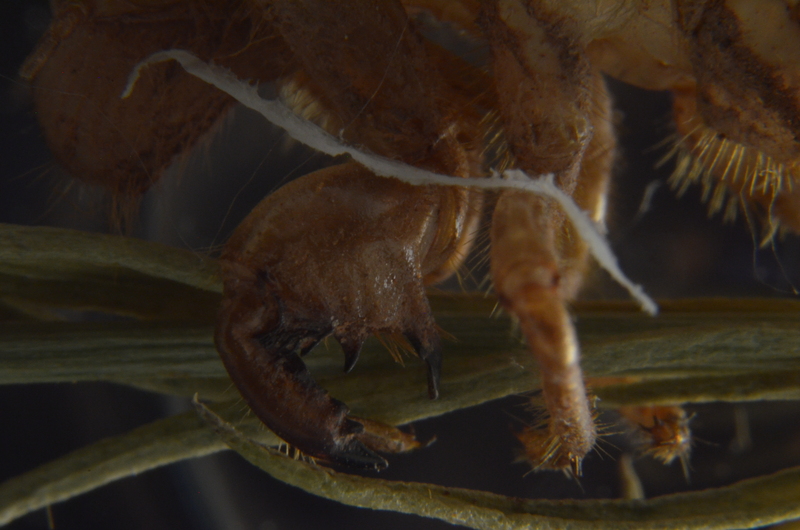 These are the legs on a cicada molt from last year’s 17-year brood. 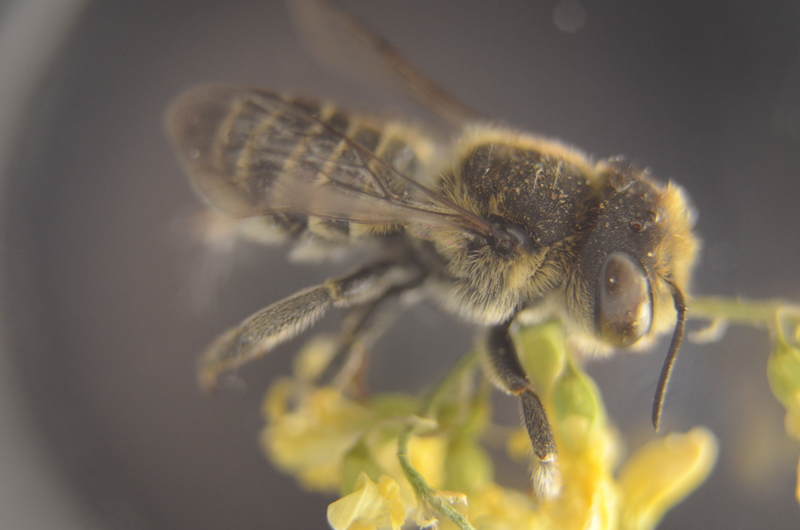 The photo was taken with the 35mm Canon tilt-shift lens at about the shortest macro-bellows distance possible. And here is a shot of the same view with the reflector attached. I used a 1/13 second exposures at ISO 1600 and f/5.6 for both shots. 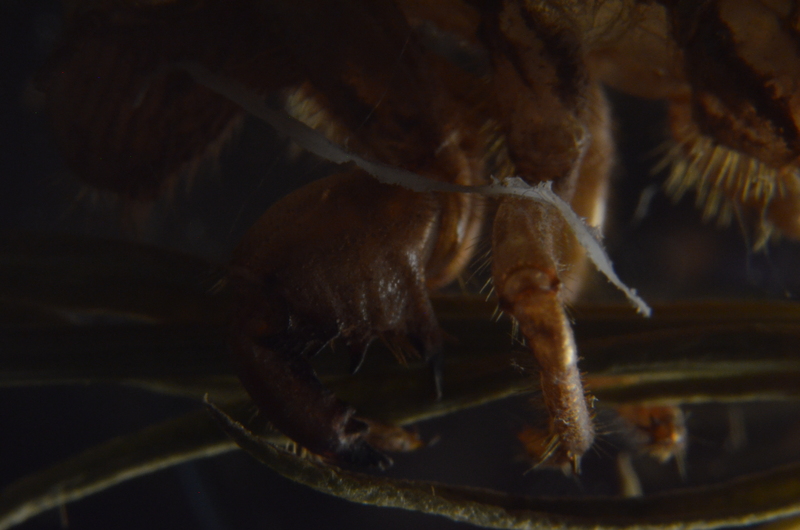 The large claws up front with (below) and without (above) the reflector. Again this was taken at f/5.6, an ISO 0f 1600, and 1/13 second exposure time. 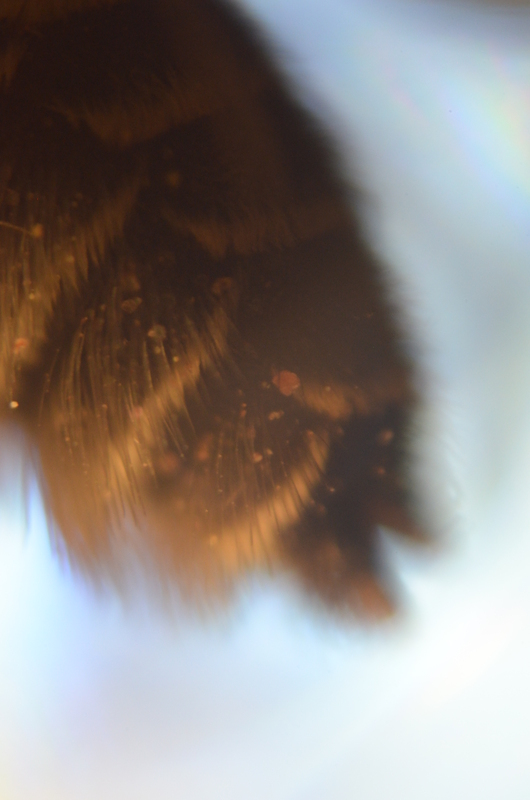 I increased the bellows distance slightly for this shot, increasing the magnification. Although the fill light is definitely better in the shots with the reflector, in some cases a photographer may prefer the image without using it, e.g. to bring out the small details with shadow. 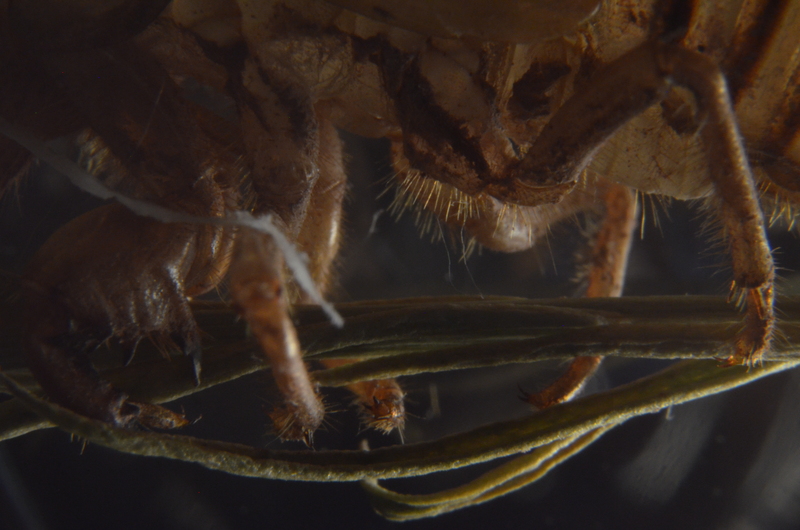 The cicada molt is partially transparent, giving a nice effect to the light transmitted through the subject. 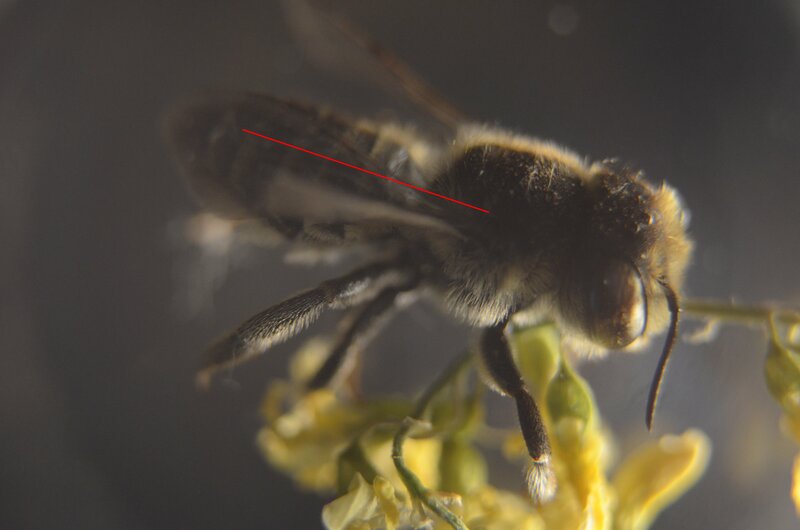 I took the two photos of a leaf-cutter bee (Megachile genus, female) below with the same setup. The difference in lighting with and without the reflector is pretty drastic. I made the next two pairs of photos using the 20mm macro lens and the squeeze Lieberkühn reflector. 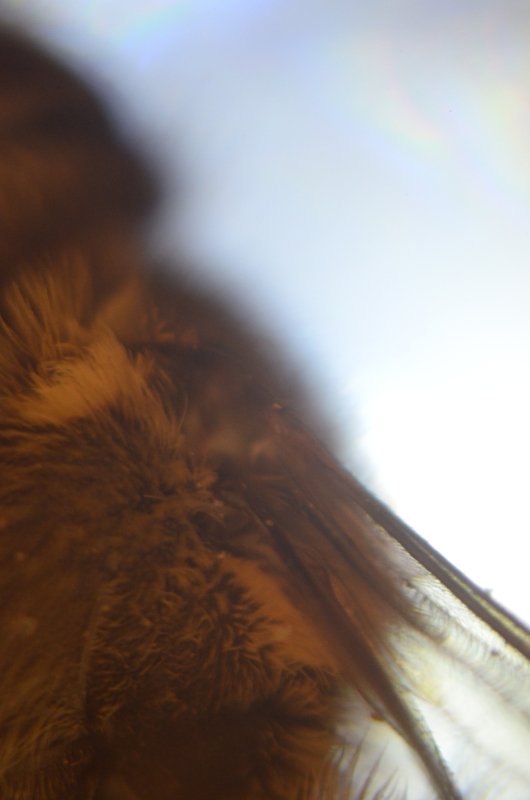 The photos contain some apparent lens flare resulting from the off-axis light source, manifesting as a slight general brightening (and resulting loss of contrast) in the middle of each image. I am not sure if the aberration is reduced with the addition of the reflector or if it just looks that way due to the rest of the image being brighter. Looks like a job for some quantitative comparisons, for the next post. The position of the lamp and bellows stand were maintained for each pair of images. The bellows was set at the same distance but displaced between exposures to make room to attach the reflectors without disturbing the subjects, so the comparison images may be focused ever-so-slightly at different depths. The lighting was definitely improved by the use of reflectors for these (mostly opaque) subjects. The images above were intended as a qualitative investigation, I will be looking into the performance and useability of the designs further. 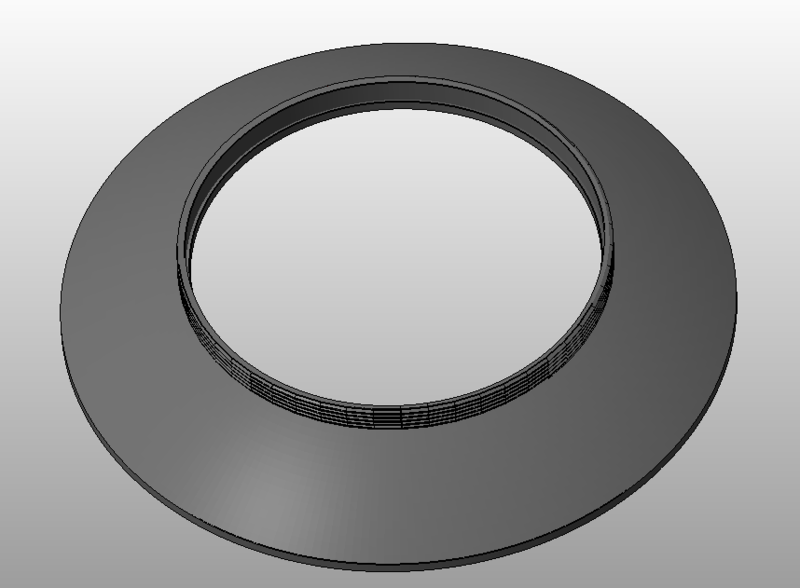 As a final note, compare the print of the 58mm threaded reflector with the render from the STL file. The consistency is inhomogenous, with some bulges introduced during manufacture that were not part of the design file. Can’t say that I’m impressed with the print quality. 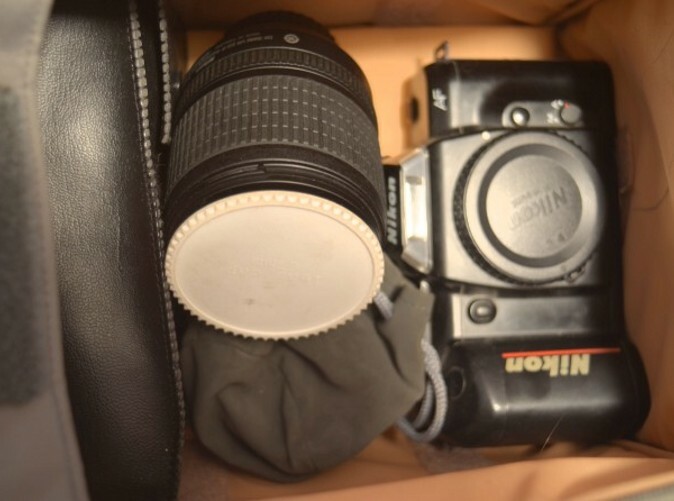 A lens hood is a shade that blocks out-of-frame light from reflecting off of the internals within the lens. This minimizes lens flares, so you can add them later in post. Just kidding. 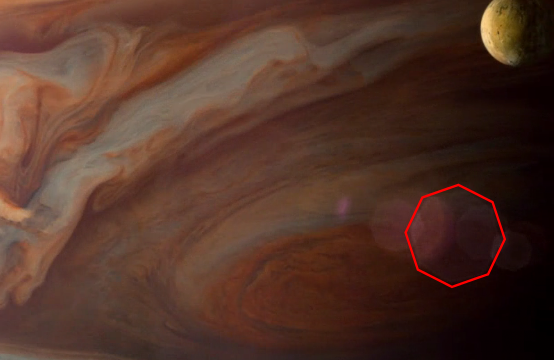 Another form of lens flare is less obvious (and I don’t think J.J. Abrams uses it). It manifests as a haze across the majority of the frame making the image appear washed-out, and it never looks good. Unlike deliberate lens flares, it’s not obvious in the image itself where it comes from and doesn’t look dramatic. To get the most effect from a lens hood, it needs to block out as much unwanted light as possible without actually showing up in the frame. 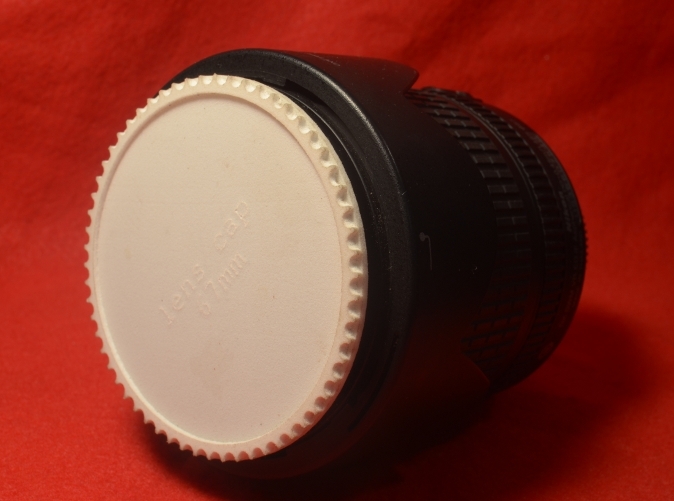 This means that for any given lens at a certain focal length and field of view there will be a best angle for your lens hood. The wikipedia article for angle of view gives an equation depending on the focal length and sensor size. The variable is the dimension of interest. 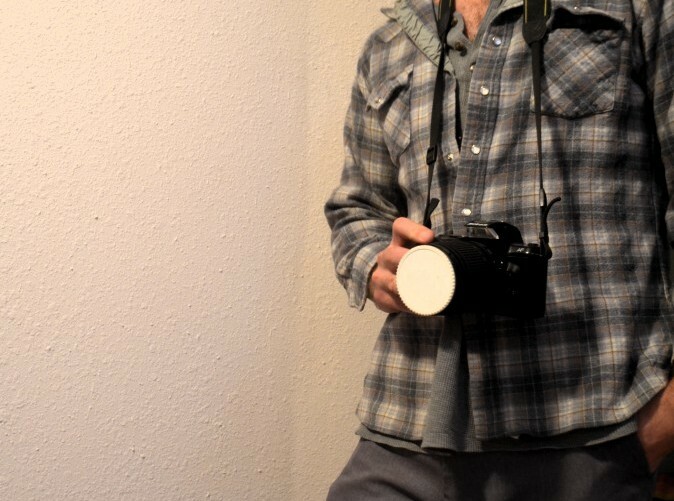 For a lens hood with a simple circular cross section throughout the longest dimension should be used, e.g. the diagonal length of a typical rectilinear sensor. The doubling factor can be omitted if you want to work the angle in relation to the optical axis, rather than the total angle. 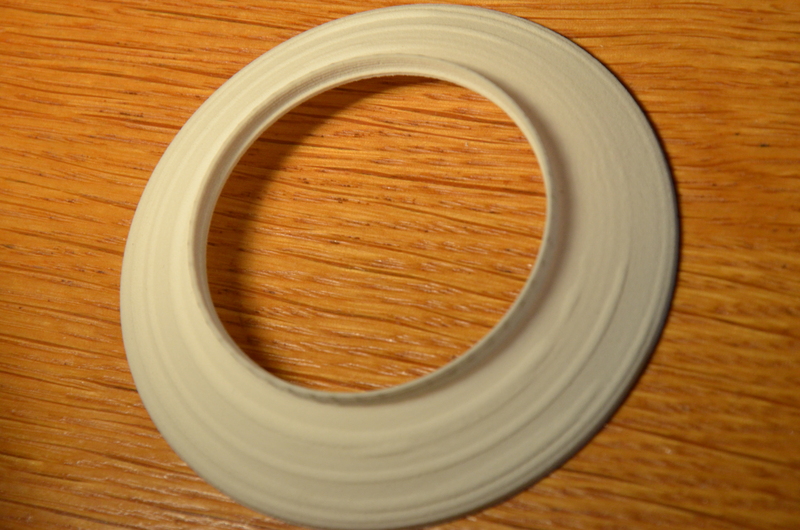 The lens hood below is a general purpose lens hood (also 3D printed) for lenses with a 58mm filter thread diameter. 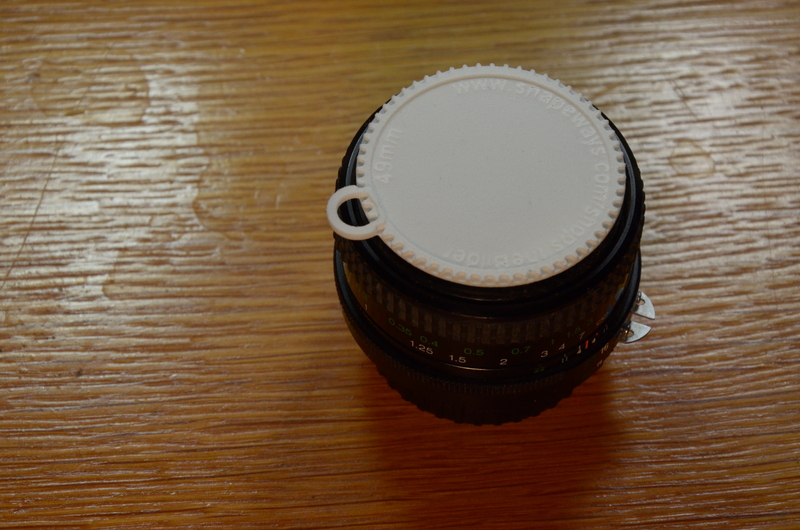 It flares out a bit, and the angle is wide enough to use with a ~27mm focal length lens. 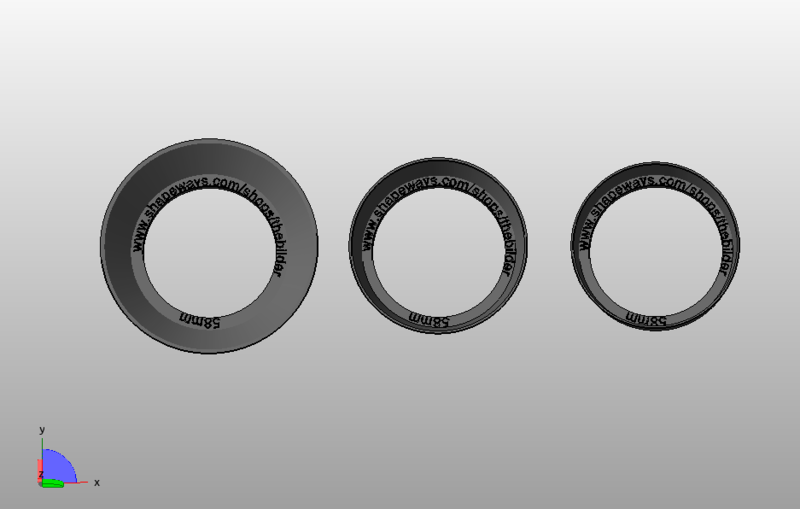 The images below show essentially the same 58mm diameter lens hood optimized for 16mm, 35mm, and 50mm, in order from left to right. 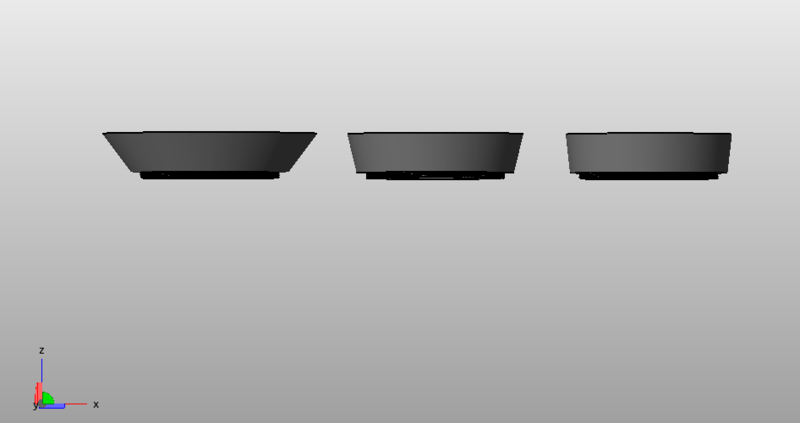 The length of the hood in each case is 16mm. 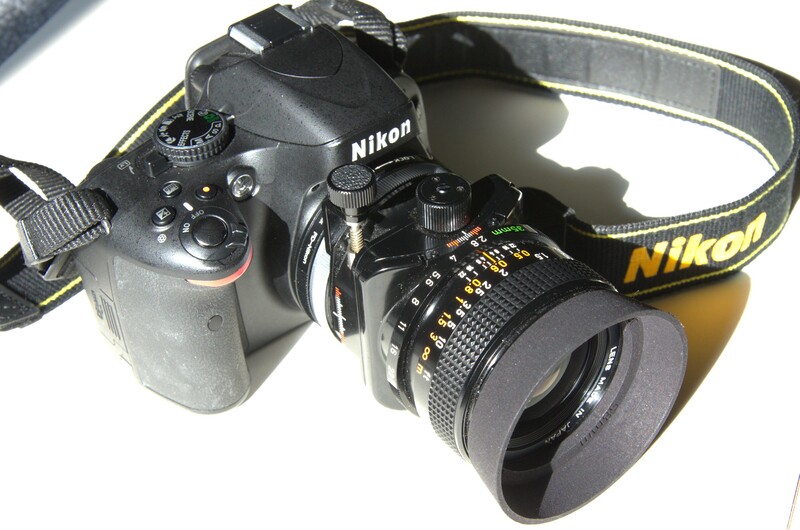 The shorter the focal length of the lens (and the larger the image sensor) the wider the angle, and the lens hood angle increases accordingly. 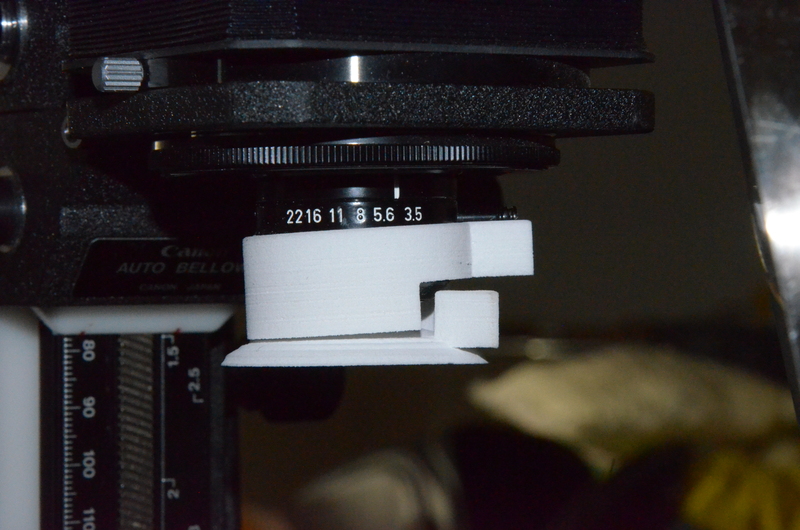 So far, I have printed the general purpose lens hood, which errs on the side of wide-angle caution. Once I have the additional test pieces in hand, we’ll give ’em the old Pepsi challenge. The new Cosmos, starring Hayden planetarium director and media darling Neil Tyson, does it with a major revamp of the spaceship of the imagination: the machine used by both Tyson and Sagan to whisk viewers around spacetime. 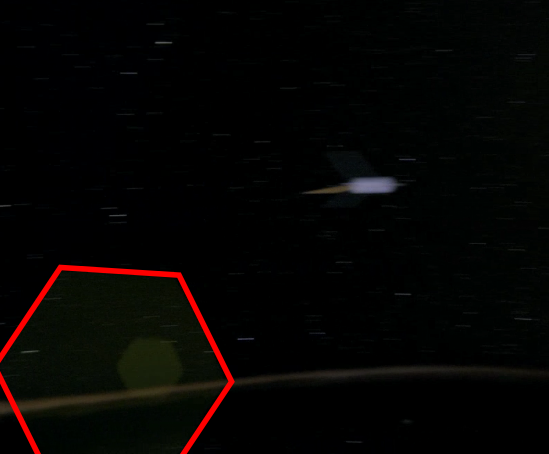 The show visuals are fairly exceptional, but I’m not sold on the heavy reliance on CGI in the new Cosmos. 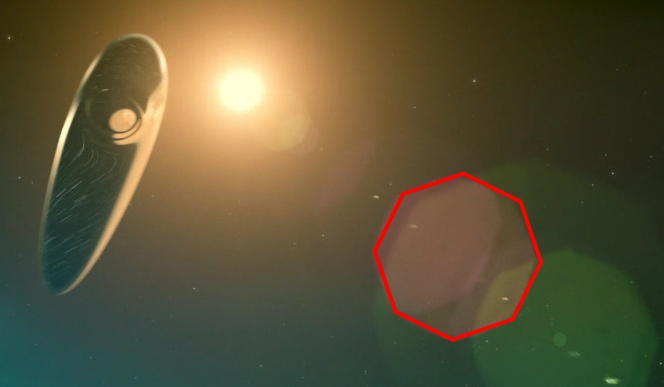 I expect this show will pull in a fair amount of imagery from real telescopes. and I think it will be an important consideration to give the viewer cues with which to distinguish the rendered from the recorded. Exemplia gratis, what are the implications of showing an outside-looking-in view of the Milky Way in the same way as a (real) Earth-based view of the Andromeda galaxy? The givens and the assumptions get all mixed up. And the lens flares OH! the lens flares. 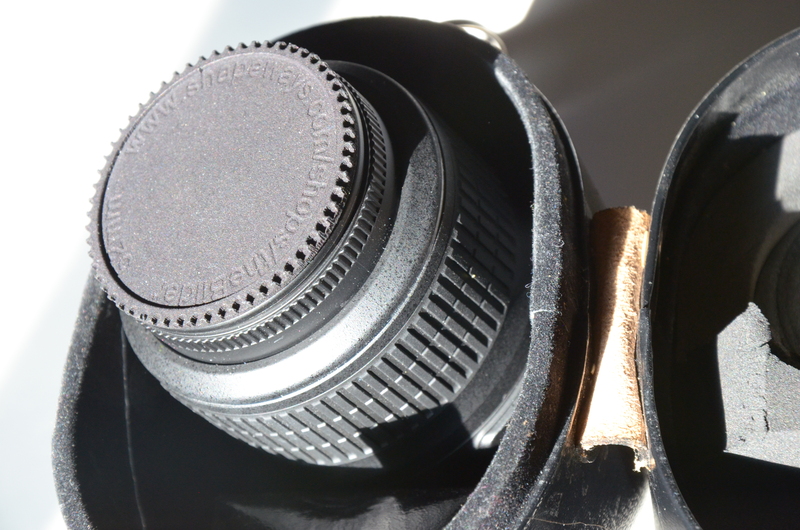 We seem to have steadfastly taken to incorporating lenses into our concept of an observation point, even when said lens has no reason to be there. 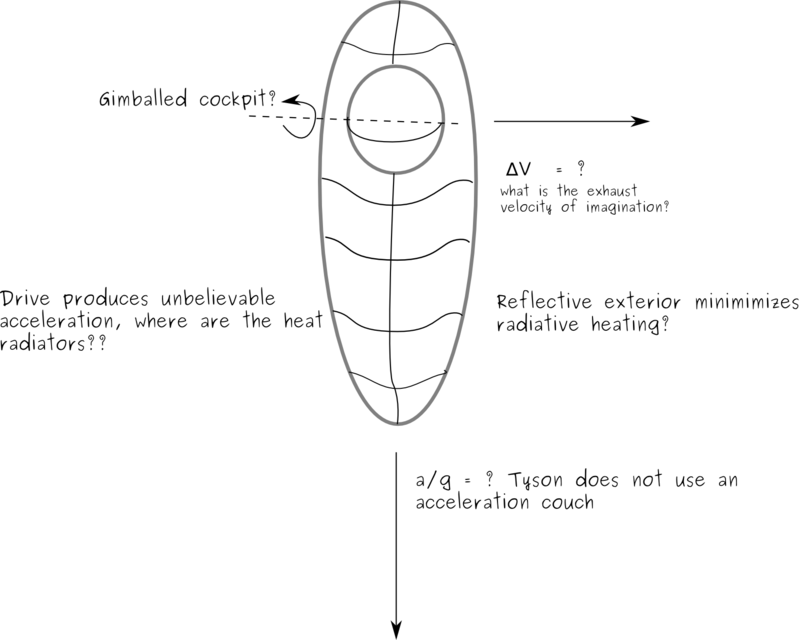 I am going to ascribe these phenomena to a Mysterious Alien following closely behind Tyson’s voyage. We’ll try to discern the characteristics of the lenses used by Tyson’s tag-along as the show progresses, based on the lens flares and other aberrations.